Choosing a marquee for your wedding or event isn’t easy. You want it to be practical and meet all your needs, but at the same time you want to make sure it impresses your guests. Remember that size does matter. Even if there’s a particular style or type of marquee you really want, it’s never a good idea to book it unless it comes in the size you need to accommodate everyone. You need to have enough space for everybody, as well as your dance floor, bar and other features. Do you go for contemporary or modern? It all depends on the style of your event. Modern frame marquees use an aluminium skeleton to support the canvas, so there are no ropes or poles holding it up. However, some people prefer the romance of the traditional marquee and it can suit some design styles better. 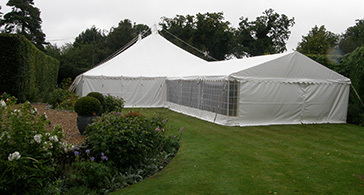 Think about how you want your marquee to be decked out and choose an appropriate design to suit. Here at Weatherill Brothers we provide a wide array of marque designs and interiors. So if you're unsure of what style marquee you want, speak to a member of our team who can help fulfil your vision.